After a couple of albums, the classic line up broke up in 1980. Lead vocalist/guitarist Mimi Betinis and drummer Mick Rain soldiered on, joined by original band member John Pazdan on second guitar and vocals. 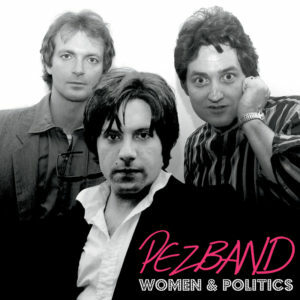 The entered the studio in 1982 and recorded the tracks that were set to become the ‘Women & Politics’ EP. However, the public’s musical tastes were changing; the new wave and synthesisers were in and the skinny ties and sounds inspired by the British Invasion were out…and the planned release was cancelled, the material shelved. Like most things that are relegated to record company archives, of course, the passing years lent the recordings a certain mounting interest. In 2016, cult archivists Light In The Attic Records (home to reissues by The Shaggs, Alex Chilton and a prohibitively expensive Lee Hazlewood box set) came to the rescue. Musically, the four songs featured on ‘Women & Politics’ are very of their time, though for power pop aficionados, this should come as both a joy and relief. Best of the bunch and armed with a heavy beat and disjointed riff, ‘Waiting In Line’ transports us back to 1981 in a heartbeat and pretty quickly, PezBand’s fusion of guitars and keys comes forth to allow a natural pop vocal to take centre stage. That vocal, drenched in 70s power pop cool, has a slight crying edge and confidence enough to sustain a verse. True to form, though, it’s during the pre-chorus everything comes alive with the addition of harmonies. The main hook, meanwhile, works a mean call and response vocal, while the instrumental break is basic but has enough loud guitar to make a point. A repetition of most of what we’ve already heard fills the second half until PezBand raise the stakes with a whole world of harmonies to pull things towards the fade. This is a great tune…it says a lot about the fickle finger of fame that it wasn’t seen worthy of release during the PezBand heyday. More Klark Kent than Pezband, ‘Office Girls’ is a spiky pop rocker that brings the best out of the guitar sounds throughout. Sporadically throughout the three minutes, this delivers great, unsubtle guitar lines full of string-bent ugliness to reinforce PezBand’s status within a post-punk scene. As such, musically speaking, it provides some enjoyable listening. It’s a good job really, since so much of the rest of this track seems a bit of a mess. Trading in a pop harmonies for an almost spoken vocal, spitting each line in the manner of a grumpy postman might have been a mistake, but even then, it’s easy to see what the band were aiming for – and everything points at The Who’s ‘Bell Boy’ for being both chief inspiration and also to blame for the iffy result. Those looking for more melodic harmonies will get their wish come the track’s end, but overall, this is a bit of a cut ‘n’ paste mess. Moving swiftly on, ‘Fab Girlfriends’ reinstates a sugary sound, decent harmonies and so much more of that ‘Baby It’s Cold Outside’ coolness. Despite having suffered a major blow to the line-up, everyone here appears so calm and keen to prove the heart of PezBand is pumping hard. It’s a dumb song and no mistake but, man, it’s also ridiculously catchy and if the style floats your boat, you’ll love it. Even with more than a passing resemblance to Pretenders ‘Message of Love’ this stands up as being great 80s power pop. Regardless of some sexist lyrics – we must remember such things were more acceptable in the rock and pop of 1981, after all – this is a top addition to the disappointingly scant Pezband catalogue. By their very nature, you’d kind of expect Pezband to end things on a high, but ‘Russian Tanks’ closes this career appendage with some heavy handed social commentary on the situation between the US and Russia in the early eighties and the darkness that came with the Reagan government. There are sounds of marching armies, exploding bombs and guitars that sound like emergency sirens cutting through various parts of the arrangement, while the vocal leans towards the suitably shouty to reinforce the uptight lyrical stance. The heavy drum line is cool and although the chorus is a bit basic, it just about all works. If there was a musical antidote to the good vibes of their own ‘Waiting In Line’ and the likes of Tommy Tutone’s ‘8675309 (Jenny)’, this must certainly be it. It’s brave but also naive…but even then, you’ll still have encountered far, far more embarrassing things in the name of politicised lyrics. There’s a little experimenting here and there, but the heart of the material on is pure PezBand and although sometimes flawed, most of this once unwanted material is strong enough to please those old fans. In the case of ‘Waiting In Line’, there’s even something to rival ‘Stop! Wait A Minute’, so that alone means ‘Women & Politics’ was worthy of releasing retrospectively. With so many bands reviving similar sounds during the early twenty-first century and with dozens of websites committed to uncovering gems from the power pop underground, it seems unfair that we had to wait so long to hear it. This entry was posted in Album & EP Reviews and tagged 80s, light in the attic records, pezband, power pop by Real Gone. Bookmark the permalink.